Dutch Design Week 2014: Eindhoven designer Piet Hein Eek has created a line of spectacles and sunglasses with frames made from two strips of titanium for Amsterdam brand More Eyewear. For his first foray into eyewear, Piet Hein Eek teamed up with More Eyewear founder Jaap Bloemer to realise an idea based around a new frame design. "His idea was to use only two lines for the top and bottom, with the temples in between," Bloemer told Dezeen. Each thin strip of lightweight titanium curves around the lenses, pinching together at the bridge and clasping the arms in between at the hinges. The arms are twisted from horizontal at the joint to vertical so they sit comfortably over the ears. "I'd never seen a frame like this, and two years later I realised why," said Bloemer. "It's extremely difficult to manufacture." The designer is launching two frames during Dutch Design Week that both implement the simple frame design. On the Aviator model, the sections of frame above the lenses are extended out above the to create a more interesting profile. The smaller Panto design has more elliptical lenses and arms that become thinner towards the ends. "Everyone in the eyewear industry tries to make something new and people work on it all day and probably think too much about it," Bloemer said. "This is a very simple idea: a frame out of two lines." 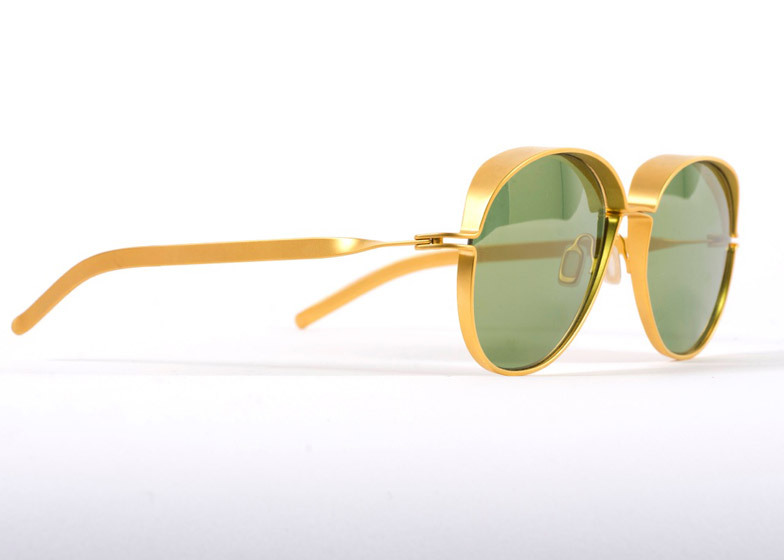 Both designs are produced in gold, silver and copper, with lenses tinted to complement the frames. The Aviators also come in gun metal and blue, while the Pantos are available in dark green and dark brown. The first 100 frames will be produced and sold as a limited edition in spring 2015. Two more shapes are also set to launch next year. Hein Eek also designed cases for the products using pieces of salvaged scrap wood, which has been formed into boxes with sliding tops. The prototype eyewear is on display at Piet Hein Eek's studio and gallery, Halvemaanstraat 30, during Dutch Design Week in Eindhoven, which continues until 26 October. Hein Eek is also showing a collection of flat-pack stools with famous artworks printed on the top and a rug designed to fold over seating during the annual Dutch design event this week. Bentel Brothers design red glasses as "squiggle for your face"